The good news is that despite being in flu-recovery mode the entire time we were in NYC, we still made it to some of the highlights that the city has to offer. Furthermore, I did the research for many more places than we actually got to visit on this trip. This was my six-year-old’s first trip to New York, and it was eye-opening to find out what his favorite part of the city was! (Hint: it was not what I thought it would be.) 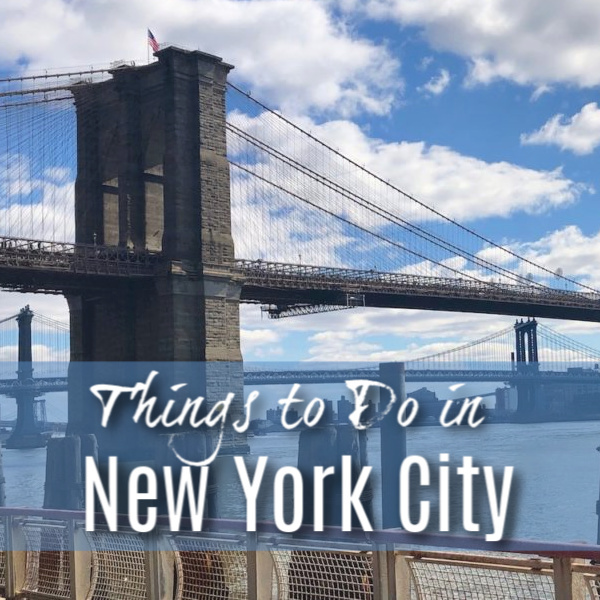 We were only there for a weekend in Manhattan, so we limited ourselves to that area — and yes, I know we need to explore the other boroughs. Next trip! Rockefeller Center is a classic New York destination, and the Top of the Rock is famous for its views of the city. I have a height-averse child, so we weren’t going to the top of anything (Empire State Building, I’m looking at you), but I was still pretty excited to take the family here. After five minutes of admiring the flags and the famous skating rink, however, we headed straight to FAO Schwartz. This famous toy store closed its flagship store on Fifth Avenue in 2015, so we were excited to find out it reopened at Rockefeller Plaza in the end of 2018. Let’s be honest: I just wanted to go play the giant piano at FAO Schwartz, a la the movie “Big” (which is now super old and the fact that I remember it is making me feel super old…) My son, however, was completely mesmerized by the entire store, and we could have spent hours there. FAO Schwarz is crowded, overwhelming, and totally amazing — just like the city itself. Inside this toy store, your child can adopt a baby doll; customize a remote control car; play with toy trains; try out science toys; stand in a rocket ship; pose with a giant teddy bear; and go wild in a candy section that features literal boats full of treats. Oh, and play a giant piano while the crowds down in Rockefeller center watch from below. Pro Tip: I would not enter FAO Schwarz without a minimum of a 1:1 parent to child ratio. It is crazy crowded and I’m pretty sure I would lose a child in five seconds flat if I had to keep my eyes on more than one. There are lots of other flagship stores nearby, too. Don’t miss the LEGO store across the plaza from FAO Schwarz. Even if you don’t go in, the window display of New York City built entirely of LEGO is a must-see, and if you have a restless child who’s tired of sightseeing, a few minutes of playing at the LEGO table will be a welcome reprieve. The American Girl store is right across the street, too, if you have children who love dolls, and want to eat lunch with them and buy them new outfits. 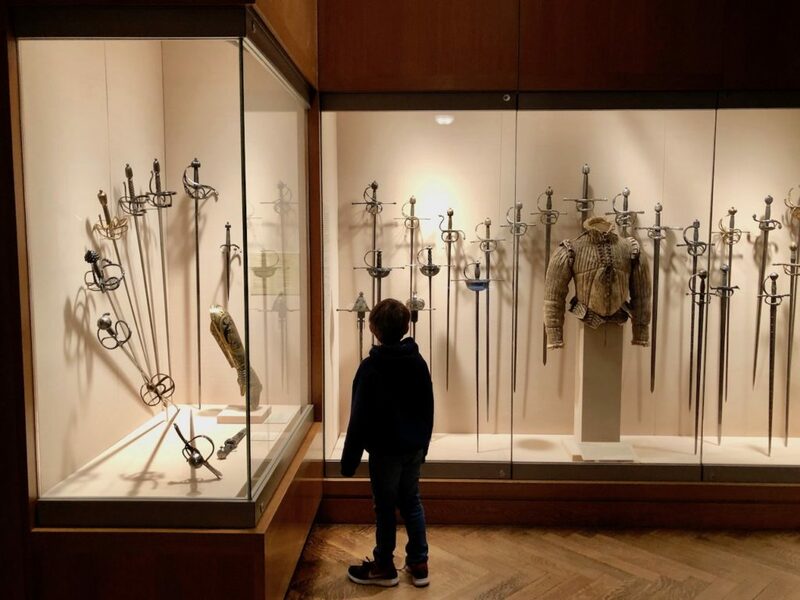 My child spent a very, very long time looking at swords in The Met. I’m not sure I would be brave enough to take all three of my little boys to The Met at once (we would be taking bets on how long before we were hustled off by a stern security guard), but I am pleased to say that the one child I did bring to this famous museum loved it. It helps that the first thing he saw was the mummies — whoever designed this museum is a genius. 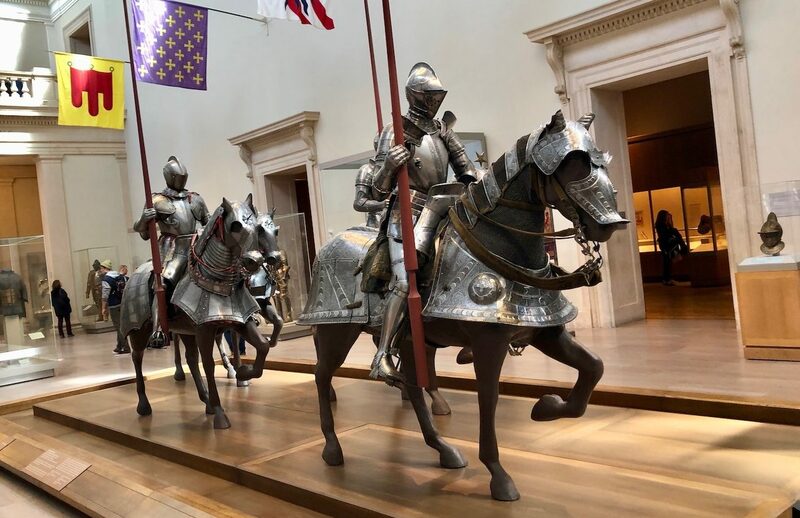 Most kids will love the mummies and Egyptian Temple of Dendur, and my little boy could have spent hours admiring the suits of armor and all the weapons. Make sure to pick up the various printed family guides scattered throughout the Met. There’s a great kids guide to the Temple of Dendur that includes a coloring page and activities. The Met is huge, but paradoxically it’s the perfect place if you’re seeking little relief from the stress of the loud, busy city. It’s quiet, and you can move through slowly. You can’t bring food or drink inside, but there’s a good cafe that’s conveniently located so that you run in to it just as your child is starting to beg to sit down. On my list of places I did not get to visit but really wanted to was The Met Cloisters. This branch of The Met is found uptown on the West Side, featuring primarily medieval art in a quiet setting. It sounds like a good place to visit with kids (even multiple kids), but my son would have been sad to have missed the mummies if we’d gone there instead, so I’m glad we prioritized the “big” Met on Fifth Avenue. After you’ve had your fill of art at The Met, cross Fifth Avenue and take a stroll around the Upper East Side. Marvel at the clean sidewalks and fancy exteriors, and keep an eye out for camera crews — we got to catch a glimpse of the filming of a TV series outside the Reardon School. For a real New York experience, stop in at the Lexington Candy Shop Luncheonette, NYC’s oldest family-owned luncheonette. It’s been featured in movies like “The Nanny Diaries” and preserved to make you feel as though you stepped back in time to the 1940s; its last renovation was in 1948. My husband noted dryly that he felt like he was on the set of “Seinfeld,” and I can vouch for the tasty Creamsicle Freeze there. If you happen to be from a suburban or rural area (like us), you may be missing bookshops. Yes, we are total book nerds over here, but also we live in a town with a serious dearth of bookstores, and the other day I realized my boys honestly believe books can only be purchased from Amazon or Scholastic. Which is why I now make an effort during our travels to seek out independent bookstores and to purchase books as souvenirs. This is your chance to experience one of the best things about New York City: it has everything. Any art, food, book you can dream up….if you are willing to look hard enough (and pay enough), the city will deliver. Including a bookstores with only children’s books, which many of us no longer have access to in our towns. Books of Wonder is NYC’s largest and oldest children’s bookstore and it has two locations. Pick up some children’s books about NYC — they make the best gift for the family and friends you left back home. 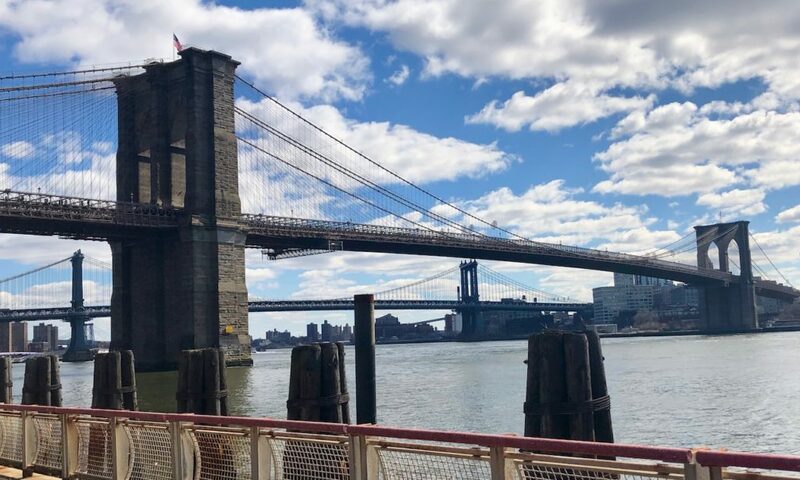 Whether you manage to walk across the Brooklyn Bridge or just admire it from the East River, the Brooklyn Bridge is a must-see for anyone visiting NYC for the first time. The famed Brooklyn Bridge is an engineering marvel that spans the East River, connecting Manhattan and Brooklyn. It was completed in 1883, and kids will love the story about P.T. Barnum leading 21 elephants across the bridge in 1884 to demonstrate to the public the bridge’s stability. There are multiple ways to experience this bridge. We got a spectacular view on a cloudless day from the East River Greenway, a walking/biking path that runs along the East River, in the South Street Seaport area just south of the Brooklyn Bridge. If we’d been feeling more energetic, we would have definitely walked across the bridge and explored the Brooklyn Bridge Park on the Brooklyn side. You can also rent bikes and bike across the bridge. If you want to view it from below, you can take a ferry or water taxi across the East River for a different perspective. On my last trip to NYC, I had one major goal, which was to see Belvedere Castle in Central Park. It just so happened to be closed and under reconstruction, because I have that kind of travel luck. Instead, we rambled through the park, seeing what we could see on a chilly March day. There’s the carousel (which was also closed when we tried to go), which is not far from the Central Park Zoo. Even if you don’t want to actually visit the zoo, a walkthrough is worth it just for a look at the charming, historic structures. There are a lot of attractions in Central Park. Unfortunately, they are not necessarily close to each other. If you want to cover more ground than your feet alone will allow, you can consider taking one of those famous Central Park carriage rides. If you have older children, there are also rental bikes to be found at various spots (we saw them on Central Park West at about 98th Street). I didn’t get that excited about the idea of another zoo, but the Central Park Zoo has a charming, historical vibe that makes it worth a visit, even outside the gates. Kids under four aren’t welcome at most Broadway shows, but for anyone else I think it’s worth visiting Broadway. Here you will see a level of talent and spectacle that is unmatched elsewhere, and it’s worth exposing your kids to this if at all possible. Disney runs all kinds of Broadway shows these days, which means it’s pretty easy to find one appropriate for your kids. When we visited, “Lion King,” “Aladdin,” and “Anastasia” were all running. While ticket prices seem outrageous, there are a few ways around this. One is to visit a TKTS ticket booth for discounted tickets for unsold seats the day of the show (or the day before for some matinees) and see what they have. The TKTS booth in Times Square is the most famous one, but there’s also one downtown and one at Lincoln Center that are less crazy. You can see online what tickets are available when the booth is open. Another option is to keep an eye on Ticketmaster right up to an hour before the show. People who can’t make it to the show last minute often sell their tickets this way. We got great seats to “Aladdin” (which was phenomenal) by buying tickets on the Ticketmaster app while sitting in a deli two hours before the show. Just remember that most theaters go dark (take the day off) on Mondays, so you’ll want to plan your visit accordingly. We decided to visit the 9/11 Memorial at the last minute, when we found ourselves downtown and looked around and realized we were only a couple of blocks from the World Trade Center. I was so very glad that we did, as it gave us a chance to to talk about 9/11 with our son. I like to slip in some history as we travel, and memorials and monuments are a low-key way to do this. The memorial is an impressive sculpture that felt haunting and empty, as I’m sure it was designed to do. You won’t want to spend long here with kids, but it’s a place you ought to visit, especially if your children are old enough to understand the context. There’s an adjacent museum, as well, if you feel your family is ready for a more complete experience and education. 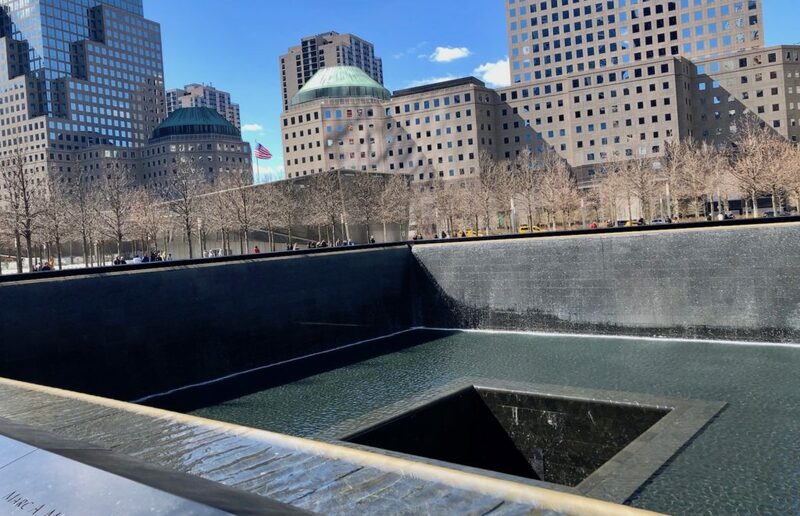 The 9/11 Memorial in New York City is a solemn place that represents a good chance to tell kids about 9/11. Since we prize honesty here at Travel with Monsters, I’m going to admit to you that I took my child all the way to New York City and he never saw the Statue of Liberty. Yes, I’m sad about this, but to understand why you would have to feel the terrible chill of the wind that winter day and know what post-flu fatigue feels like. I just couldn’t handle putting us all on a ferry, where it would definitely be colder and windier. I had plans, however, to take the free Staten Island Ferry, which provides great views of the Statue of Liberty. If you want get close to her majesty in all her stony flesh, you’ll need take a different ferry, which is not at all free; you can read here about how to get there. In the meantime, we will keep reading our favorite book about her and call it good: I highly recommend “Her Right Foot” if you’re looking for phenomenal children’s book about the statue. The Highline was another place on my list of things to see in New York with kids that I didn’t make it to on my recent trip. 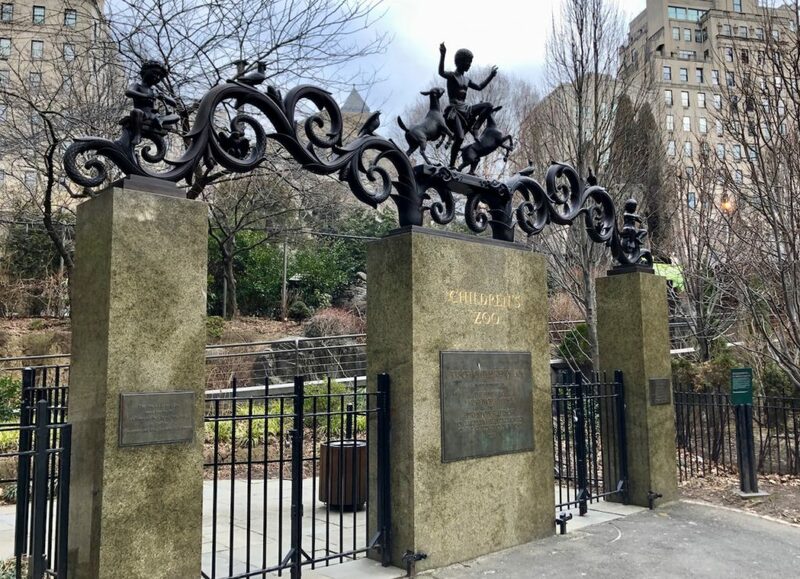 It’s an old elevated railroad track on the west side of Manhattan that has been converted to a park, and a community gathering place where you can frequently see performing artists. I think I’ll save this one for spring or summer, rather than winter. Can you believe this amazing galaxy mosaic was in a subway station? No wonder this kid’s favorite thing to do in NYC is ride the subway. If you ask my son what his favorite part of this trip was, he will tell you the subway. No joke. All he wanted to do all day was ride the subway. Admittedly, I am raising kids far from a city so this kind of thing is terribly exciting for them. You are probably riding the subway anyway, to get from point A to point B, but while you’re at it, watch for musicians and for subway art. Musicians will occasionally climb aboard, perform a song that may be quite impressive and may be spectacularly bad, and then collect an offering for their troubles. It’s definitely worth a dollar just for the experience. Art is scattered throughout the NYC metro system, and you can either go looking for it or just keep your eyes peeled while you travel. 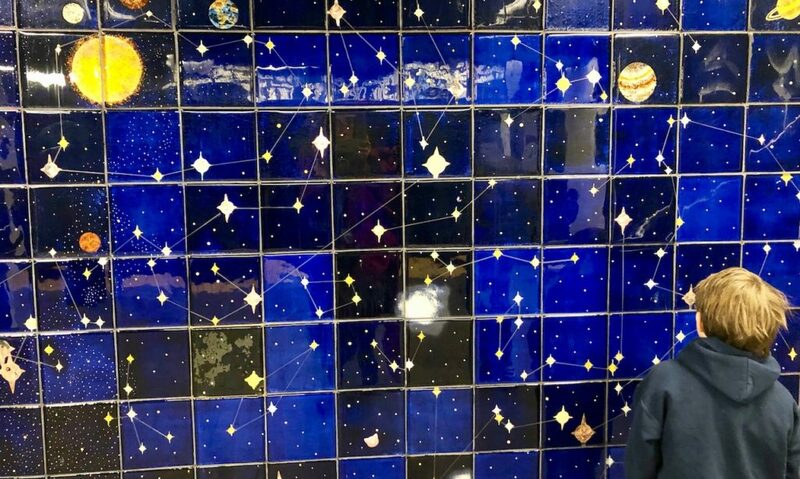 We were excited to stumble upon the tile mosaic solar system located at the subway stop adjacent to the Museum of Natural History and the Planetarium. For a guide to the art in the NYC subway system, check out this website. All right, what did I miss? Do you have favorite spots to take kids in Manhattan or elsewhere in NYC that I didn’t mention? Find us on Facebook or IG and let us know, or email us — we love to hear from readers!